British virtual band, Gorillaz, are back after a 5 year stint on the sidelines since their breakout album, Demon Days. It was always going to be tough to make an album as good as Demon Days but Plastic Beach fell shorter than I thought it would. 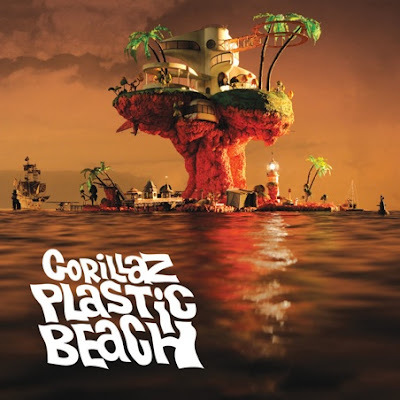 Collaborating with artists such as Snoop Dogg, Bobby Womack, Mos Def, De La Soul and many more, Gorillaz have produced a very unique blend of music for this LP. They've left no genre untouched with tracks involving The Hypnotic Brass Ensemble to The Lebanese National Orchestra for Oriental Arabic Music to a bit of electronic work and a hint of hip-hop with Snoop Dogg and Mos Def. All up, it came across as a bit unstructured. The album didn't seem to flow from track to track. It was almost like they made a bunch of songs they liked and just threw them on a CD. Sort of like a mix tape, except if you don't love these songs they can just seem out of place and hard to get into. I'm not a big fan of the style of singing their vocalist 2D has, it's almost monotone to me (and not a good style of monotone like Guru). I immediately got into track 4 though, Rhinestone Eyes, but other than that, none of the other songs really caught my eye. Although, Bobby Womack does do an amazing job on vocals for "Stylo". I listened to the album a few times, went away from it then listened to it again and I started to get into it a little more. I can put up with it now but I won't be in a rush to listen to it again. Also, check out their track "Stylo", it's a pretty cool clip.